The Bentley Rare Book Museum is located in Kennesaw State University's Sturgis Library on the ground floor. 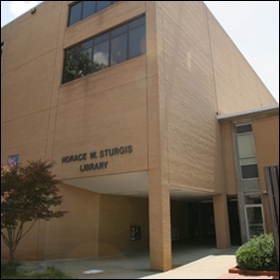 The library, named after the university's first president, Horace W. Sturgis, is designed to support and advance the teaching and learning activities of the greater university community. Built in 1981 with over 100,000 feet of space, the library has more than 600,000 volumes of books and government publications. There are more than 3,300 serial publications and well over 1.2 million pieces of microforms. Access to this extensive collection is through the online public catalog which is available in the library, on the campus network, and via the World Wide Web. For research purposes, faculty and students have access to GALILEO, a broad array of full-text and full-image databases such as ABI/Inform, ERIC, Lexis/Nexis, Medline, and Periodical Abstracts. The online public catalog also provides access to over 10 million volumes held in the University System of Georgia and University Center in Georgia Libraries. Parking: Guest parking is available at all lots on the weekends and weekdays after 7 p.m. Paid visitor parking is available during alternate hours.